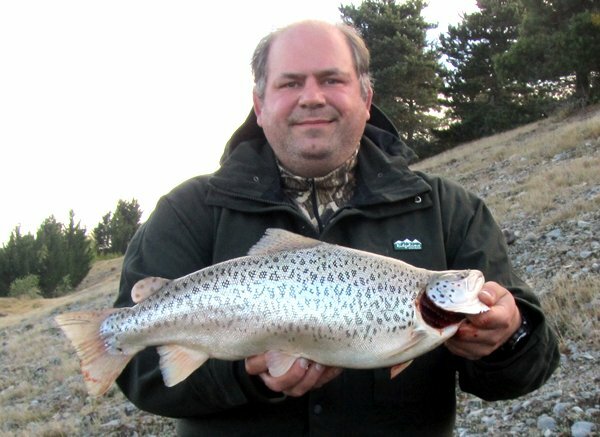 Large brown trout weighing 3 kg caught at Lake Selfe in the Canterbury high country. The brown trout has been by far the most successful of all the freshwater fishes introduced throughout New Zealand in the latter half of the 1800s. The colour and markings of brown trout differ greatly deepening on the environment and the age of the fish. Small river-dwelling fish tend to be a brownish green with brown and red spots. Older river-dwelling brown trout are a darker colour and often have a lighter coloured ring around the dark spots. On the South Island’s West Coast, where the rivers and lakes are often tea coloured from vegetation runoff, the brown trout are usually butter coloured. However, there are many variations of brown trout colouring from water to water. Lake dwelling brown trout are frequently more silver in colour. Sea-run brown trout caught in Canterbury’s Waimakariri River. These fish are mostly silver in colour. Brown trout originated from Europe. They were introduced into New Zealand from stocks that had already been established in Tasmania, Australia. At the time those anglers interested in making brown trout releases into New Zealand were well aware of the difficulties being experienced in Australia. The first unsuccessful shipment of brown trout ova was sent to Tasmania as early as 1848. However, they were not successful until 1864. The problem was transporting ova by sailing ship from Great Britain such a long distance across the heat of the tropics. Back then the journey took many weeks. The New Zealanders thought it prudent to wait and see how the Australians fared rather than attempting to import their own brown trout ova from Great Britain themselves. However, the Southland and Canterbury Provincial Councils made very significant financial contributions to the Australian cause. This is a massive brown trout. Unlike many of the other brown trout shown on this page the fish really is brown. At this stage, I don’t know who sent me this picture so I can’t say who the angler is, or the weight of the fish. Hopefully, I’ll find out soon. One this is certain; this is a very big brown trout. Importations into New Zealand began as early as 1867. Numerous further importations took place over the following 20 years. When attempting to import trout from one country to another it is more likely to result in success if ova are transported instead of living fry. Ice can be used to keep the ova cool which slows their development without any detrimental effects on the numbers that hatch. Colourful spotted brown trout caught at the mouth of the Waimakariri River, Canterbury. Although taken close to the river mouth it has the darker brown and reddish spotted markings of a resident fish. Brown trout are a major freshwater sports fish in New Zealand and can be found in almost every stream, river, and lake south of Auckland. A fishing license must be purchased to fish for brown trout in New Zealand. Here is an interesting brown trout taken on a Mrs Simpson killer pattern by Christchurch angler Keith Chin. Note the large body size and relatively small head. This is what happens when the fish has a good food supply and grows very quickly. The condition factor is high. I guess you could say this is a fat fish! Despite numerous releases of rainbow trout into rivers and streams over the years by Acclimatization Societies, and Fish & Game Councils, the majority of these liberations have been unsuccessful. Therefore most rivers throughout New Zealand hold brown trout only. It is difficult to say exactly why this is the case. It has been shown that rainbows prefer rivers that flow into lakes, and the larger the better. Examples of the best New Zealand rainbow trout fisheries are the central North Island lakes like Taupo and Rotorua, and the central Otago lakes like Wanaka, Dunstan, and Wakatipu. These lakes have significant inflowing spawning rivers that the rainbows move up into in winter. This huge sea-run brown trout was caught at the mouth of Canterbury’s Rakaia River by Allan Burgess. It is almost as big as the quinnat salmon caught there. Note the silver colouration of this fish caught fresh from the sea. It had been feeding on smelt (silveries). Sea-run brown trout are the same species that spend part of their lives at sea taking advantage of the rich food supply available there. Read all about sea-run brown trout. Smaller brightly coloured brown trout are often found in faster flowing, shallow, river water. As the trout grow larger they are better able to compete with bigger, highly territorial browns, and eventually move into holes and deeper river water. Brown trout are easier for the angler to spook. They will often head to deeper water and go in search of cover when disturbed. They are generally harder to catch than rainbow trout. In lakes, browns will cruise a beat along the shoreline, whereas rainbows are more likely to swim away from shore. In any given water occupied by both rainbow and brown trout, the angler will generally find the rainbows more inclined to hit a fly or lure than the browns. When lake trolling, rainbows tend to make up a higher proportion of the catch. Brown trout forage for bullies, snails and aquatic insects in lakes and are more likely to hunt close to shore; particularly at night. Rainbow trout are inclined to school and hunt for smelt in mid-water and are therefore mostly found in deeper water than browns. However, these behaviours depend on the lake and food supply available. Rainbows being more inclined to hunt for fast-moving prey like smelt could at least in part help to explain why they are more readily hooked than browns. Brown trout from the Wanaka Hatchery, Central Otago, New Zealand. Brown trout spawn in the autumn and early winter. They do so in freshwater only. The female digs a redd in the stream bed where she lays up to 2000 eggs that are in turn fertilized by the male. A beautiful spotted backcountry brown trout. The heaviest brown trout caught in New Zealand weighed 42 pounds. However, this fish was taken from a canal near a salmon farm in the McKenzie Basin and had been feeding on pellets that drifted downstream. There have been several brown trout taken in the same area that were also very close to this weight. Most of the brown trout caught in New Zealand weigh much less. There are many 10 pound fish caught throughout the country. However, most fish landed by anglers are smaller and typically weigh less than 6 pounds. Initially, it was thought that this trout, caught near Tekapo, may have been a brook trout, but it is, in fact, a brown trout with quite unusual markings. The condition factor looks to be very high. it measured 60cm and weighed in at 9.5 pounds. Many thanks to David van Rooyen for sharing his pictures with us. Here is the same brown trout again pictured at the bottom. Above it, and caught in the same area, is a monstrous and unusual looking rainbow which weighed in at a massive 22 pounds. 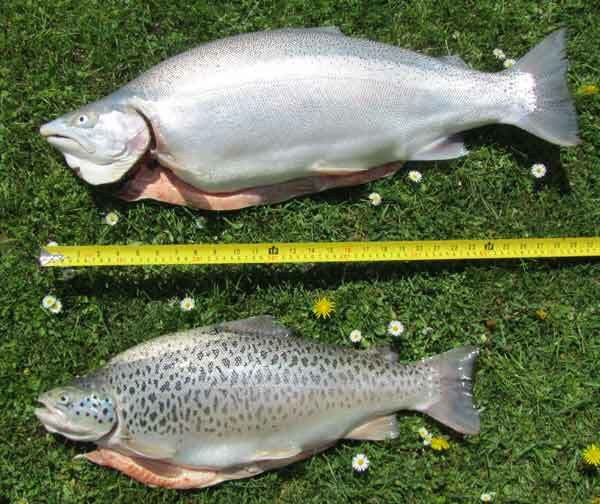 This is a good example of how trout colouration is affected by food supply and environment. Trout can grow very quickly when there is a good food supply available. Below: Sea Run Trout Fishing in the Waimakariri River, Canterbury New Zealand. Spin fishing in the lower reaches of this alpine fed river during the month of November 2014. Video courtesy of Kevin Belcher.